Thought leadership is not about boasting or bragging, rather it is about sharing informed insights to hopefully inspire people. 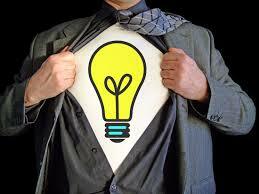 Thought leaders are not afraid to propose new ideas, new models or different views on a topic. Thought leadership when done correctly can help further a person’s career or a business. Being a thought leader should mean becoming a trusted source of information on your chosen topics by delivering the answers to the biggest questions on the minds of the audience seeking enlightenment or education. So here are a few tips on using content marketing as a launch pad in thought leadership for you, your business or even the team you mentor. They speak to educate not to sell. Thought leaders seek out opportunities to present as to impart their insights from research or experience. They rise to the challenge of delivering opinions so to drive debate on topics. Thought leaders advance the adoption of ideas by speaking on commercially relevant, and research backed points of view. They are dreamers and doers; they talk about “blue sky strategy” from their own research or from research gathered through clients, customers or competitors. They rarely speak about product, brand sponsored white papers or rehashed content that copy ideas already well discussed. Give time freely with no expectation can propel someone into thought leadership and general awareness. A good lesson here is to accept non-paid speaking engagements if it puts you in front of an audience that facilitates dialog and exchange of opinions. Regardless of the event, the audience or the setting, a thought leader will always deliver meaningful content. Thanks to social media and the access to content marketing channels, a constant flow of well researched articles which you have written will keep you visibility high and credibility in-tact. Thought leadership is not about writing a few 600 word articles and then retiring your pen, in a digital world people will soon forget you. A constant stream of articles shared across social networks and forums tells people that the author is a thought leader year worth following on a continuous basis. Articles need to be a minimum of 800 words although most research based articles can be 1500 words plus. Longer, deeper articles demonstrate the time taken to craft the story, to prove research undertaken and ensure reference points are covered in detail. Once an article is written, the article needs to be published. For whitepapers and heavy research based articles, a good starting point is a professional or membership based organisation to which you belong that publish articles. Explore trade publications that cover your industry or topic. Also submit articles to local newspapers, on-line news, on-line interest groups and publications. Consider sites like BizSugar, LinkedIn Pulse, Academia, and inc.com, Forbes or Harvard Business. Make sure to also publish to your own social networks to reach more people and improve your profile in visibility. A few options include publishing to your own website, your blog, and post on your LinkedIn profile or to groups, publish to Tumblr, Google+ or Medium.com, send out an email with article link to clients and connections. Send out a message regarding your article on Twitter, Facebook and relevant forums you feel would benefit from reading the article. Research does not have to mean focus groups or an academic background, it has more to do with , homework on the topic you are going to write about. Write about topics you have expertise in, deep knowledge and first-hand experience in. Focus on writing great content with supporting information that will make you stand out from your competitors by giving more than just a bunch of research jargon or results. Articles should be interspersed with references, quotes, trends, external research, supporting documentation or forecasts. Though leaders will use the research element within an article to gain the readers trust when sharing ideas, creative thinking or a different view on a topic. Some research and support ideas include interviewing experts in the field you are writing about, conduct surveys, share real stories about your own experiences, tap into social media channels to gather opinions or ask someone in authority to write a footnote. A mistake to avoid if never publish in a hurry. Save a draft, let it cool and with fresh eyes review it yourself, rewrite sections where it does not make sense, spell check it and then depending on the level of “news” within the article you could share it first among friends, work colleagues or a mentor to check for errors and give you honest feedback. The vision of every thought leader is to be in the spotlight. The knowledge you share can bring about business opportunities, social influence, a better job, an award or an accolade, acknowledgement from your industry or a mention in a newspaper that engages your audience to rally behind the topic you have been championing. A constant presence on the speak, write, research channels can lead to an invitations, doors being opened and new ventures that never possible before, including the chance to mentor and encourage other people to become thought leaders themselves. For lots of thought leaders it is a very personal journey, a deeper reason around, why am I here, what is the meaning to my work, what would I like to leave behind? As the articles get published, the influence will grow and the exposure to inspiring people will be the most rewarding. As a thought leader, regardless of the topic or reach of your publications, you will leave a lasting legacy for yourself, other people, a bright young business brain or even an industry. Sales leadership should not be confused with sales management; sales management implies authority to manage the sales team whereas being a sales leader implies team buy-in and commitment from the sales team towards higher business goals. In a rapidly changing sales environment, decisive sales leadership can be the difference between a company that thrives and a company that struggles to acquire enough customers to survive. Here are a few qualities sales leaders have that separate them from just being sales managers. Selling is a numbers game, being a sales leader is part people artist, part data scientist. A successful sales strategy is measured in results – performance against targets. Were the sales results better than last quarter? How fast is the company’s revenue growing? Sales leaders know there cannot be “sales teams higher order needs” if the core sales results are not being delivered. Sales leaders through to sales managers or front line sales supervisors need to be number driven, using the data as proof of leadership effectiveness. Using data for sales and performance analysis allows sales leaders to make decisions for future sales growth or plans. The sales management aspect of running a sales team is mostly tactical, at the coal face level, sales leadership is about understand the business mission, the product strategy, the market dynamics, having a vision to where the sales growth can flow from and then putting in place plans and direction. Sales leadership is about taking the time to think strategically. Sales leaders impart there vision while stamping there mark on the culture of the sales organisation. Sales leaders devise sales plans, define, communicate and redefine the sales processes while uncovering sales effectiveness drivers using KPI’s. Sales leadership is about getting the balance right between “Activity based management” and “Results based management”. Strong sales leaders empower their sales managers and sales reps to succeed using results based management. This means that Sales VPs or senior management sets the results and vision; they then empower the sales management and sales teams to execute the agreed sales tactics. Leaders lead and managers manage, this is why sales management is more focused on day-to-day sales execution and coaching the sales teams to sell more effectively. Sales leadership focuses on the data coupled with business mission to map out plans that gets buy-in and commitment from all the sales to the point where the sales team(s) WANTS to follow the sales leader and believe in the vision and strategic direction that the sales leader has communicated. The effort and dedication to earn the title “sales leader” is high, and the business acumen along with business skills sales leaders must master require time and learning. The path to sales leadership is no easy walk, and not every sales manager will join the ranks of company sales leader (usually a director or VP title. Why? Well research suggests that the average lifespan of VP sales is about 24 months. Why the short career? Today’s tough business market means the CEO has to deliver growth and change. If the sales leader does not manage the change, the CEO changes sales management. Business leadership can be hard to define but it is a title many aspire to regardless of company size or industry. But is business management different to business leadership and which of these traits (leadership or management) is the most valued when promoting someone to a senior role. Is the term “business leader” being overused to the extent that it is rendered nearly meaningless? The press and online articles are full of sound bites and quotes from business leaders. What are these so called business leaders?. Business leadership was once deemed to be a wealth generator, someone who took a risk, set up a business to create wealth while generating employment or was instrumental in delivering huge growth for a company. So are the real business leaders people like Bill Gates,Michael Dell, Larry Ellison or Steve Jobs to name but a few right down to the heroes of a local economy, small business people who create opportunity and employment for their local area. Anyone with a Twitter account and a blog is a Business Leader. It is important to state that titles are an important aspect of any organisation, business or company. They indicate a certain level of achievement, authority and responsibility. However leadership used to mean something specific. High level executives. Leaders of industry. 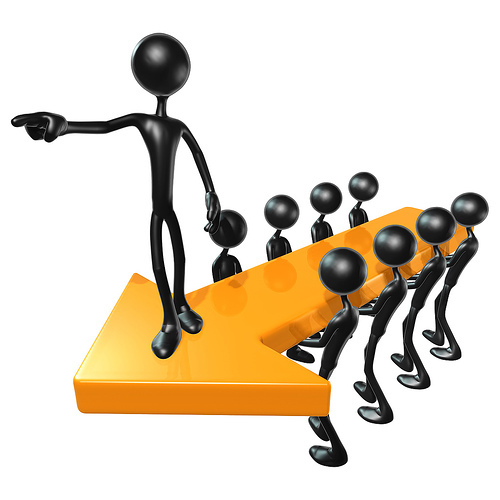 Time was you would never call a middle manager or a front-line supervisor, a leader. Today it seems when anyone kind of picks up the ball and runs with it are called people or business leaders. What we’re really talking about here are people who are engaged in the business. So we have become accustomed to seeing the term business leadership being used in a very broad sense. This is probably the reason middle or senior managers in large multi-nationals often get referred to as “business leaders” in press articles. Most do not define business strategy, how the business operates, the culture or the direction of the business. So the business leaders we often see quoted in the press in most cases are business managers (even if they do have the title VP or director they are in reality managers). Title inflation, self-proclaimed titles, and title overexposure are the cause of dumbing down leadership titles. When titles are overused or abused, they lose their meaning. Business leadership has nothing to do with titles. A C-level title, does not automatically make someone a “business leader.” In fact no one really needs a title to lead. The reality is anyone can be a leader in their community, sports club, in family, all without having a formal title. There are lots of business managers who aspire to be business leaders but lots more do not. Having an MBA with a C level title while working within the cushion of a large organization does not a business leader make. The role of these business managers is to “Implement”. That is to take the pre-defined strategy and Business goals and implement them whether its sales,marketing,finance or product. They may lead the unit or division from a tactical stance but they do not lead the business. The world seems to fallen in love with titles and in a centralised decision making business world maybe bigger titles such as VP or Country Manager are a way of compensating for the true role a manager is expected to perform. Business Leadership has nothing to do with level of seniority or someone’s position in the hierarchy of a company. Too often in business, when we discuss the company’s leadership we are most likely referring to the most senior executives in the organisation. They are just that, senior executives or business managers. Leadership does not automatically happen when you reach a certain pay level. Hopefully business managers can work to earn the title business leader but there are no certainties. If you are reading this article hopefully you love business and business strategy, the cut and trust of sales,marketing, trying to win a customer, managing people to deliver higher results but this does not make us a business leader. Knowing ones place in the business world is healthy and honest. First and foremost “Know Thyself”. No need to perfume the pig, a great manager is a great manager, no need to embellish it with titles that do a disservice to the title “business leader”, a title many aspire to but only a small portion ever really earn the right to be called it. 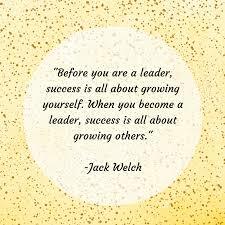 Not everyone in business sees themselves as a potential leader. Maybe it is really about being the best at their job they can be. A few tips to build up a leadership profile includes (A) they learn to act like a leader: to manage their image in a genuine, authentic way. (B) They are straightforward; they tell people what they stand for, and then stand for it. (C) They are inspirational and learn what motivates people. They are optimistic and use emotion in their communication. (D) They know the people they are leading and help them develop and (E) They stimulate people, make people think and make them take responsible but always with the positive support of a business leader knows they must provide. To win more customers and grow, every business needs to focus on getting the sales team selling, they need to get sold on sales actions and sales time not just the company’s sales process. One question any salesperson needs clarification on is “what do you want me to do”. Seems like a easy question for a sales leader to answer,”Go sell”. So what does selling actually mean in your business?, is it revenue, margin, revenue by product line, number of new deals?. Once upon a time selling was easily quantified. In the day of the door to door sales, all a sales person needed was the product to demo and enough streets with enough door bells to ring. Simple numbers game, keep knocking until someone opens, give the sales pitch and close. Today in the digital era, sales has moved inside, online, blended, push,pull, hunter,miner, gatherer and the systems supporting the sales process have gotten more complicated. First we had contact management with software programs like Goldmine, then came CRM and now Sales Force Automation.Which makes me wonder, has actual selling time got second billing to the sales process?, are sales people more engaged in the sales process and systems than the actual selling itself?. Maybe its time to spend longer fighting for more sales! Sales models for many companies have become more complex and less efficient in the quest for data, putting pressure on the rate they can acquire customers, productivity and even shifting the focus point from selling time to process time. The guiding principle of all sales and marketing teams is to maximise selling time, lead generation and relationship building. That may sound obvious to any sales leader, but it is important to remember that the drive for data and sales insights can collide with the forces of rising complexity in the sales process. 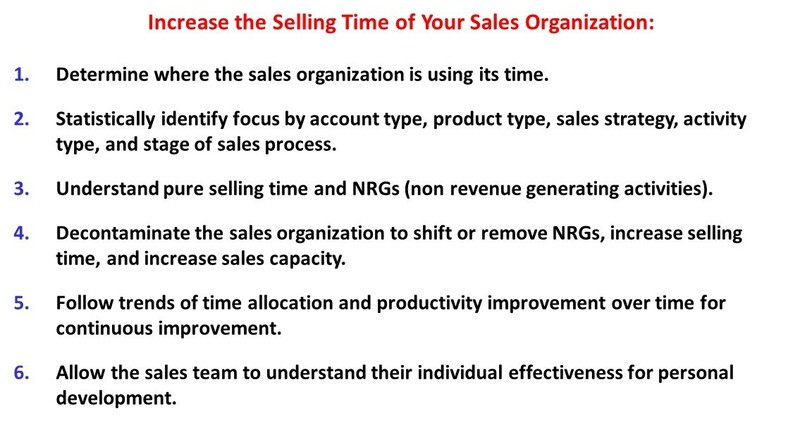 In fact, sales teams can over time slip comfortable into being sales processors against being sales winners. Companies must understand and clarify the scope of their sales teams while promoting efficiency throughout the sales process. There are thousands of ways to kill a sale but only a few ways to win them. Some ways to kill a sale are obvious like not showing up to a meeting prepared, not following up, not listening, not establishing a realtionship, going to proposal too early, not speaking to decision makers… the list goes on. These can be easy to identify and with some training and practice can be overcome. Then there are the sales killers that hide beneath the surface that many companies and sales managers do not even know exist. 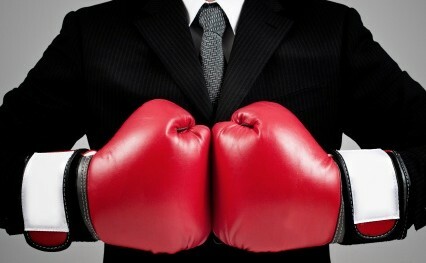 These are the sales weaknesses in the sales process (over reporting anyone?) which when combined with a salesperson’s own make-up can act like weights pulling down the sales efforts and results. Aligning your selling efforts with sales process takes work. Sometimes companies can be cautious about meddling with the sales force—directors and even owners need to overcome the common fear that disrupting it will hamper revenue or market intelligence. Then, other stake holders from not only sales, marketing and sales support but also other functions, such as finance, must work together to identify and prioritise the expected outputs from the sales engine. Next, successful sales teams transformations require support from the very top: someone has to take the lead, get the senior people from across the company to sit down, share data, and be willing to talk about what’s not working. This leader must override internal concerns, see the big picture, and focus on the best solutions to boost the time spent selling regardless of past practices. Changing the sales focus and sales teams activities may mean changing the sales talent as successful sales teams refocusing may change how people carry out their roles and the ways other stakeholders interact, from customers to marketing and back offices. An example of refocusing the sales team selling time, was an Internet company who set aggressive targets for sales metrics such as the number of new customer interactions per week. Giving the sales people goals they could not meet without changing their behavior forced them to adopt to the change in sales focus. Success became self-reinforcing: the more they stayed in the business of selling the better they performed. In larger companies, viewing sales operations across departments may not be easy, nor is implementing changes that affect the entire sales process. Yet the more sales operations can be streamlined and admin reduced, the more likely customer satisfaction will improve as deals close quickly and sales pipeline grows faster. At these companies, the result can often be millions of Euros in higher revenues and lower sales costs. Get the right sales people and channel in front of the customer at the right time. It may not be enough to transform the sales teams by hiring people with the skills and capabilities to sell solutions to target sectors. Companies might have to restructure their sales coverage model, which means defining the sales roles differently. The questions to ask, include how much hunting versus gathering capacity to employ; what the role of sales specialists should be; whether to use one or multiple sales people to serve a segment or customers across different geographies. When to hunt for new customers and when to mine deeper within current customers is one of the answers that needs to be made explicit to any sales team. Too many sales people often get comfortable serving their current customers, so an obvious initial step is to charge them with becoming more aggressive about mining the largest customers to their full potential. At the same time, however, the life blood of any business is acquiring new customers. That’s why an effective coverage model needs to be deliberate about who should be hunting and where. Sales managers should meet regularly with hunting sales people to understand and actively refine their target prospects and beach-head plans. Given the degree of sales difficulty and the strategic value of acquiring new customers, sellers should receive a compensation recognition for breaking into new accounts. Whether hunting,farming or mining, it’s critical to get the mix and sequence of sales skills, sales training and specialists right. Do not ignore a sales stream because there’s no sales expert in-house to cover the area with the skills the target customers considers crucial. Sales people need to learn and be taught how to orchestrate effective teaming. Like musicians who seamlessly improvise back and forth after they have played together several times, salespeople who get to know and trust one another tend to sell together more effectively. They need to understand that new customer conversations are a priority, building and expanding relationships is more important that a spreadsheet and get the answer to “what do you want me to do?.